Starts March 1st, ends March 29. Write a 50-100 word post for each daily prompt on your own blog during March (weekdays only). Come back during each day of March to leave a comment on that day’s post with your own link. 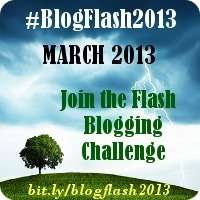 Follow along on Twitter: @tglong #BlogFlash2013 or Facebook: #BlogFlash.